In-depth comparative assessments of the compound–target affinity profiles of drugs can reveal a great deal about the compounds’ pharmacological behavior. This paper examines how the pX values in Reaxys® Medicinal Chemistry reveal multiple target families for a whole range of drugs with the classical 1,4-benzodiazepine scaffold. In silico profiling is a powerful tool for determining the range of targets a compound can have. While selectivity is a traditional criterion in choosing lead compounds as it helps to avoid potential side effects, many traditional drugs act on more than one target. Their therapeutic action in several cases is probably explained by this complex, multifaceted pharmacological behavior. In silico profiling is a powerful tool for determining the range of targets a compound can have. To illustrate this, in silico profiling was performed on 1,4-benzodiazepines, a classical medicinal chemistry scaffold. The profiling technique takes advantage of the vast amount of experimental data already extracted, structured and available in the Reaxys Medicinal Chemistry database. Compounds with a benzodiazepine structure (Figure 1) exhibit hypnotic, anxiolytic, anticonvulsant and myorelaxant effects and thus have therapeutic uses in treating anxiety, insomnia, agitation, seizures or muscle spasms. They enhance the effect of the inhibitory neurotransmitter gamma-aminobutyric acid (GABA) at GABAAchannels. This results in a depressant effect on several central nervous system pathways. The core chemical structure consists of a fused benzene and diazepine ring, classically with nitrogen in positions 1 and 4 on the diazepine ring, although some other diazepines have also been described. This in silico profiling study focused on these 1,4-benzodiazepines. A substructure search for 1,4-benzodiazepines returned 57,757 compounds with the relevant scaffold from Reaxys Medicinal Chemistry. These compounds are involved in 93,909 reactions, have 175,964 bioactivities associated with them, show activity against 2,838 targets and were extracted from 11,707 citations. To facilitate comparisons of bioactivity data from different publications and assay types, all the data points in Reaxys Medicinal Chemistry have pX values. They are calculated by transforming EC50, IC50, Ki, etc. into pEC50 = -LogEC50, pIC50 = -LogIC50, pKi = -LogKi, etc. These are normalized values assigned to the data to enable straightforward quantification of compound–target affinity regardless of the origin of the data. The Reaxys Medicinal Chemistry Heatmap (Figure 2) visualizes the relationships between compounds and their targets in terms of key parameters, allowing rapid identification of relevant interactions. The figure shows a section of the activity profile for the most potent 1,4-benzodiazepines for which in vitro biological data has been mined from the literature and their associated target proteins. Most potent means a pX above 7.0 (affinity < 100 nM). Here, there are 6,885 benzodiazepines active against 301 targets. In the Heatmap, biological affinities or activities are quantified with the aforementioned pX values which range from 1, indicating low activity and displayed in blue, to 15, indicating high activity and displayed in red. 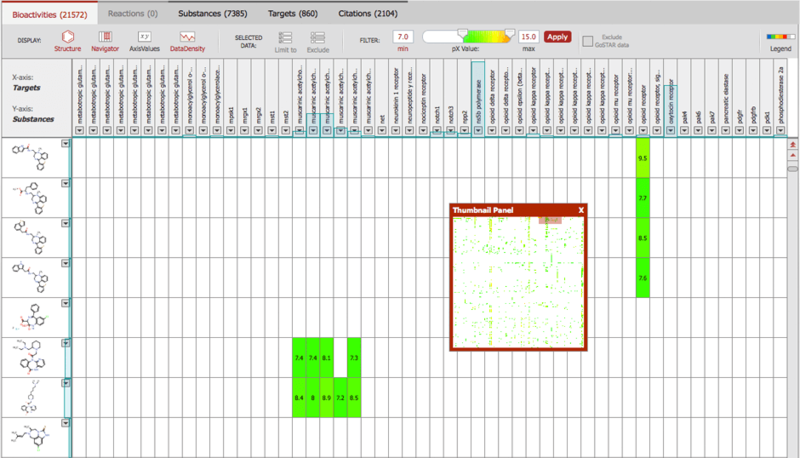 The color of the Heatmap cells represent the maximal pX retrieved for a given benzodiazepine compound (row) against a given target (column). Grey cells indicate that qualitative data is available; white cells indicate a lack of data. 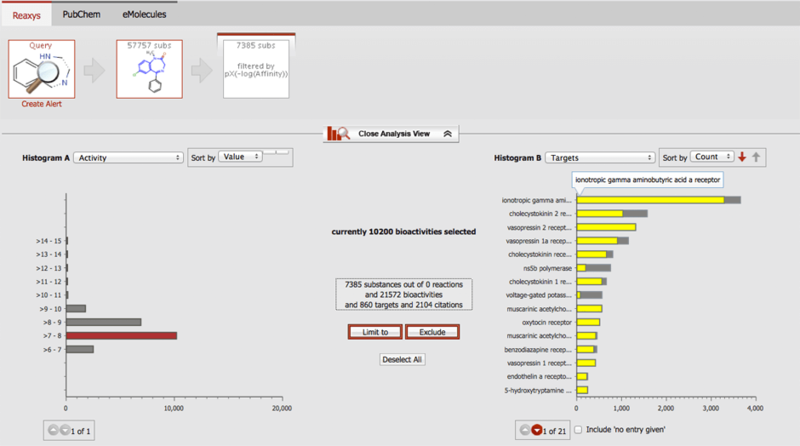 Reaxys Analysis View is a paired histogram-based analytical tool that lets users select analysis criteria to get a sense of the relationships between results. For example, it permits quick discovery of the individuals and organizations that are active in a particular area of research, sorts results according to yield, or reveals the catalysts or solvents for a particular reaction class. Here, it has been used to view the number of molecules retrieved per target (Figure 3). The top 7 most common targets with pX values greater than 7.0 (affinity < 100 nM) were the GABAAreceptor (3653 occurrences), the CCK2 receptor (1573 occurrences), VPR2 (1314 occurrences), VPR1a (1152 occurrences), the CCK receptor (804 occurrences), NS5B polymerase (754 occurrences) and the CCK1 receptor (660 occurrences). Note that they represent four target families: GPCRs, kinases, proteases and ion channels. Figure 4 shows the structures of the most active 1,4-benzodiazepines for those targets. Figure 3. Analysis View of the most common targets with pX values above 7.0. The number of 1,4-benzodiazepine compounds with pX values between 7.1 and 8.0 against each target are highlighted in yellow in histogram B.